Wahoooo!!! What a day! This was definitely one of the best days of the season so far. Everything came together just right. Amazing weather, perfect spring corn snow, no ridiculously early start, no slogging and a great descent with no mental input required………! Things have been quiet on the ski front the last few weeks since returning to Oslo from Chamonix and I have to admit that I was definitely over the season. But not now….!! Wahoo!! 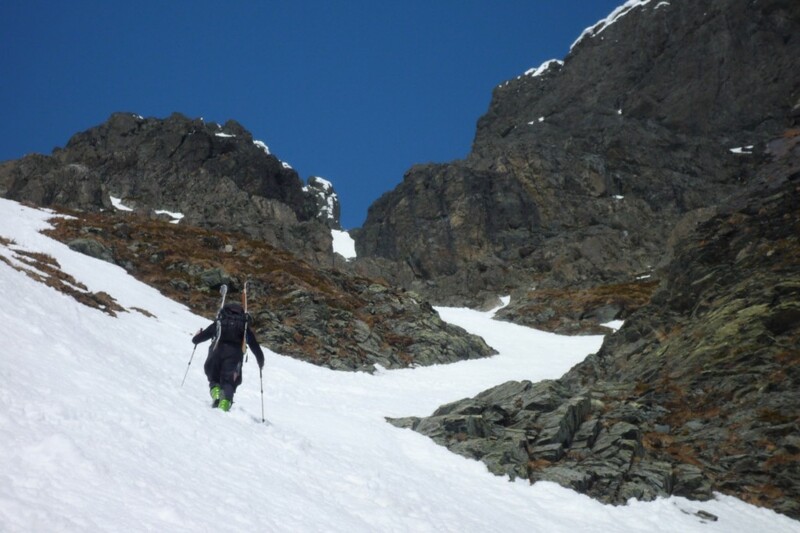 I hooked up with my Norwegian friend, Lars Thomas, a telemarker (but of course ;)) and we left Oslo at 8.00 with nothing particular in mind and were geared up and ready to skin up the apron of the couloir by 12.00. 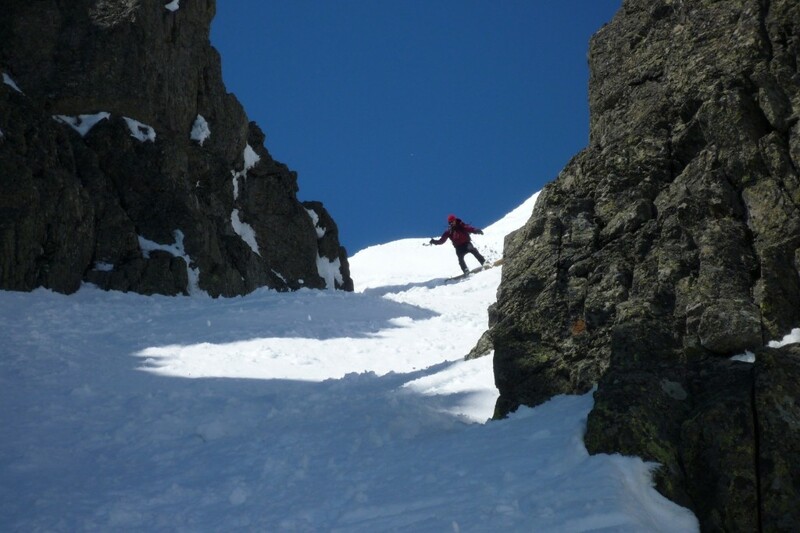 The skies were completely empty of clouds and the couloir had been taking a lovely dose of sun all morning. One of the luxuries of skiing here is the latitude and the angle of the sun (i.e., it being much lower). The snow was taking nowhere near as much of a beating as say the European Alps where timing is essential on southern aspects. Ridiculously early starts… Not a fan! That afforded us a nice leisurely pace and made the day a lot more enjoyable. From the road which runs right below this peak, it’s about 850m to the summit (according to my watch) which is just off to the East of the couloir entrance. The actual couloir itself is about 350 to 400m long (that’s my guestimate). 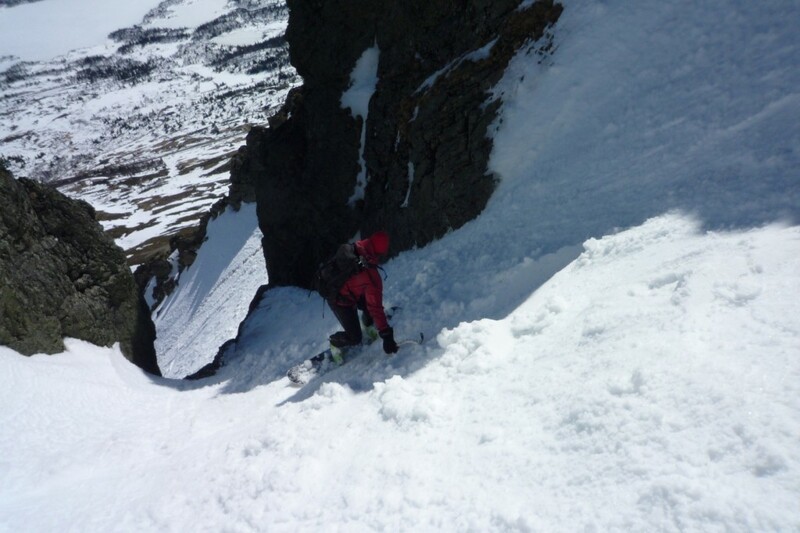 The lower section of the couloir is high 30′s to 40 degrees and gets steeper as you climb past the “crux” which is a 3m rock band around the middle of the couloir. There was a thin section of snow/ice here on climber’s left which made it easy to climb up (even with 1 ice axe and no crampons). 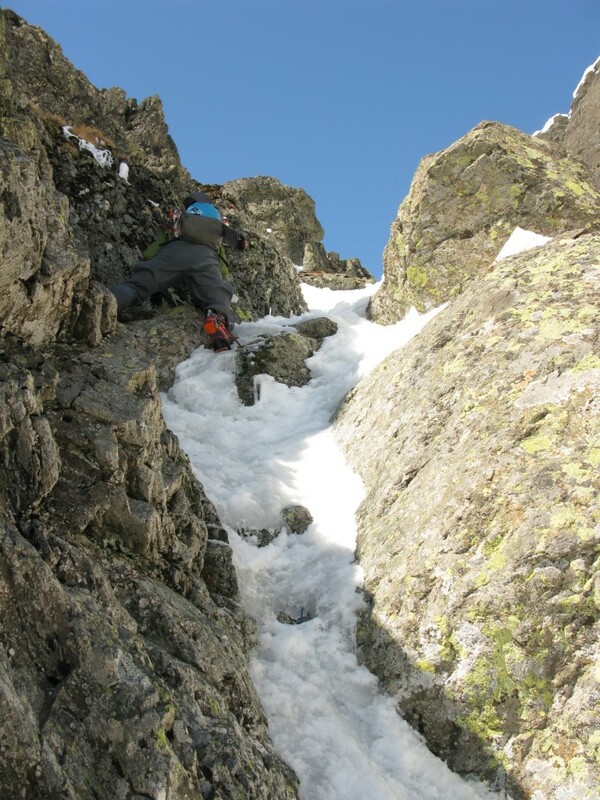 In the upper section of the couloir, there are sections of 45 degrees but it is never sustained. Bit of a mixed bag….. 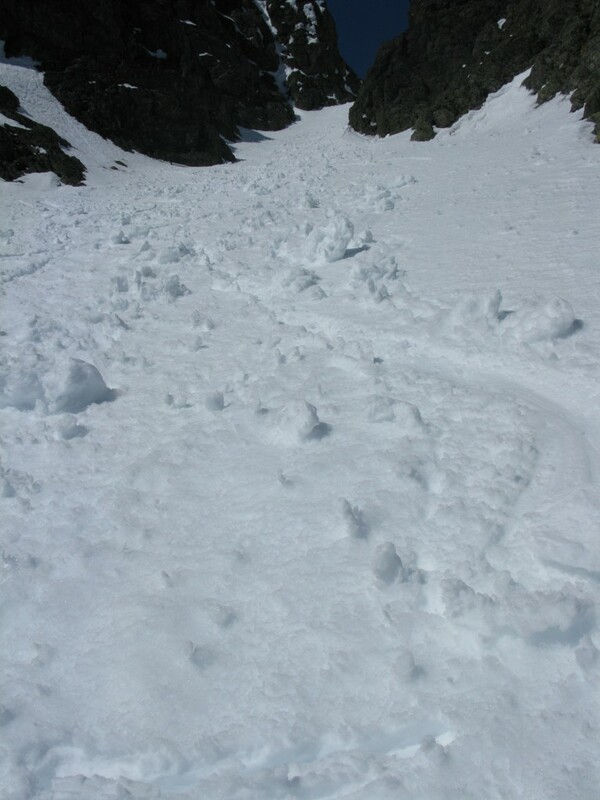 There were a few people skiing down the couloir while we were climbing it so we didn’t get untouched corn. 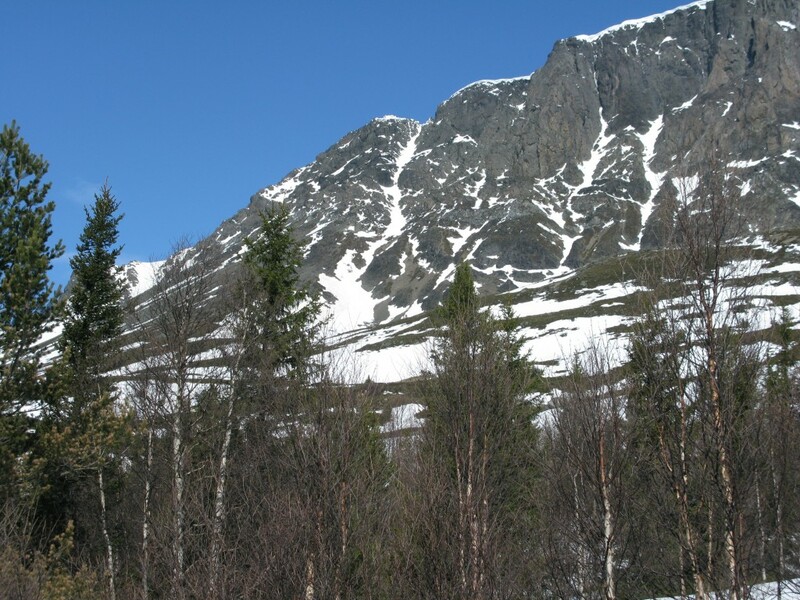 I’m not sure how often this gets skied but it’s supposed to be a bit of a Hemsedal classic, so I suspect a fair bit. I’m pretty sure we did witness one first that day though…..!!! 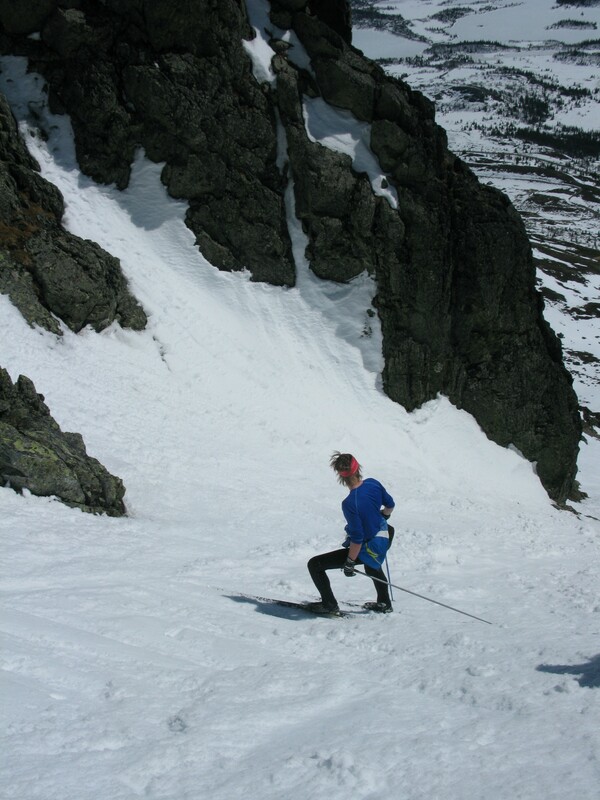 One crazy Norwegian (by the name of Simen) skied it clad in his cross-country lycra and his cross country skis!! Why….I have no idea but he seemed to be enjoying himself even if it was extremely sketchy and he looked close to losing his balance a few times on solid 45 degrees. Each to their own. Simen in his lycra and cross country skis! Oh, by the way, for those who use this for beta, the boot pack up was perfect. Just enough penetration for solid steps which never collapsed. Beautiful. From the car to the summit took us just over 3 hours (not including a lunch break) at a pretty leisurely pace. 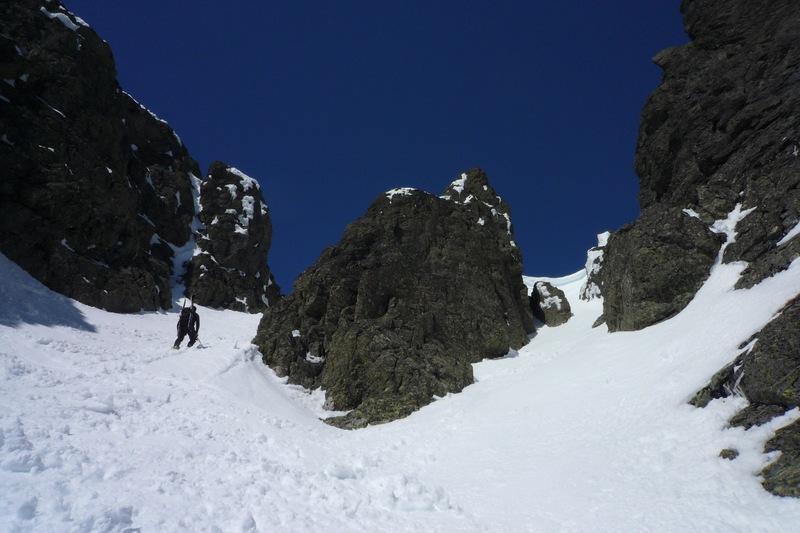 We didn’t hang around long on the summit as it looked like the top of the couloir was about to return to the shade, transforming the snow to something a lot less pleasant to ski. We caught it perfectly. What can I say…..it was just brilliant! Great snow all the way down and some lovely turns. The couloir narrows after the first section (about a board length for a metre) before widening again and gets steeper (the steepest section of the couloir: 45 degrees, maybe a bit more…). This then leads to the “crux” which we downclimbed. 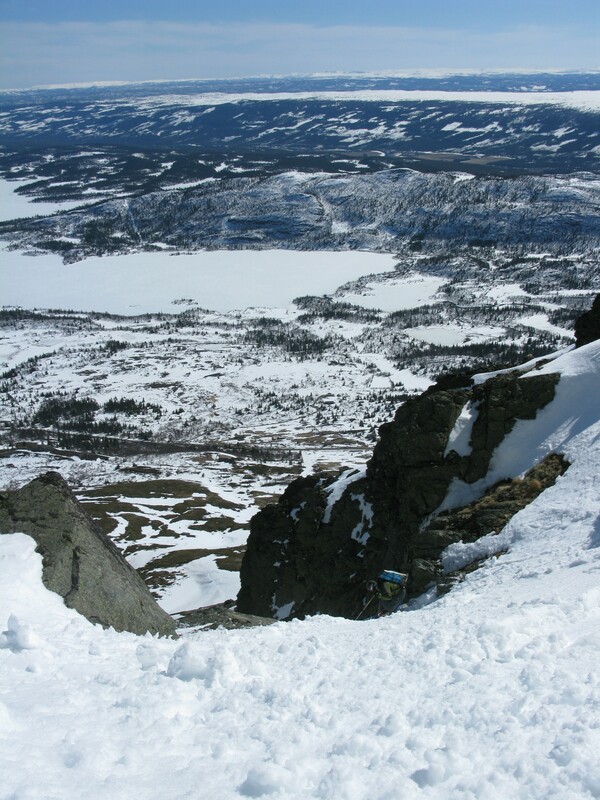 One of the snowboarders who passed us on the climb up let go of his board downclimbing this and it raced another 400m to the bottom. 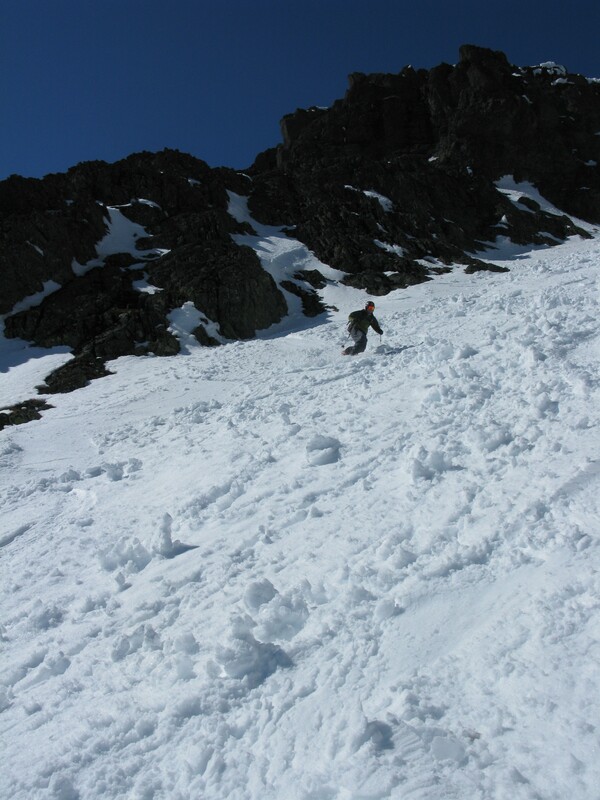 And this was the best part of the couloir……… Not good. Rack it up next time, mate! It would be nice to have a rope next time unless you drop it which is doable (I was feeling much too sensible and my hero juice is not what it used to be ;)). There are a few bits of tatt to use although I didn’t look to see how safe they were. What was to come was just some of the best skiing in a while. A lovely pitch and beautiful corn, linking turn after turn. Bloody ridiculous! 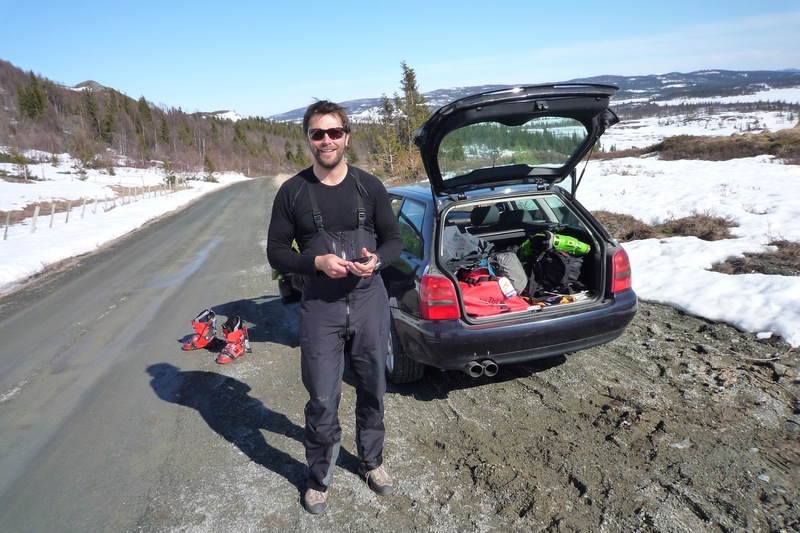 All good things have to come to an end and we navigated our way down the patches of snow to the car. I do look rather pleased with myself, don’t I!! 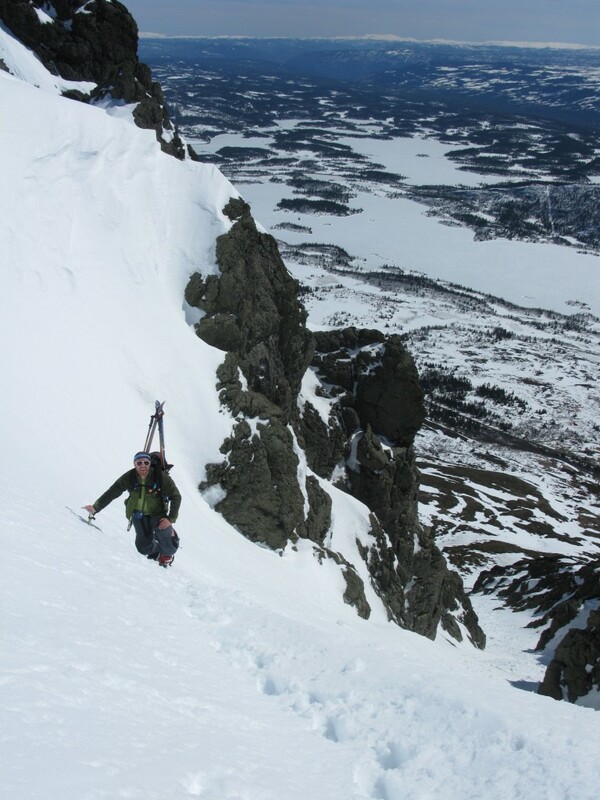 This entry was posted in Hemsedal, Norway and tagged Backcountry, Backcountry skiing, Hemsedal, Norway skiing, Skiing, Skogshorn, Snowboarding, Splitboarding. Bookmark the permalink. Je sais… Il etait fou, ce mec. Comment ca va ta saison? T’en as des projets encore ou est-ce que c’est fini pour toi? Tu veux pas aller faire Laila…?